Summer is just around the corner! Later sunsets means weekendBBQs and vacations. But it also means people will be working on their beach bodies and shopping for the best sales on fitness apparel. With PosterMyWall's awesome deals on bulk flyers and posters, you can spread the word about your swimsuit deals, discounts on gym memberships, and deals on fitness packages. We also offer double-sided flyers and posters! Click a poster template below or browse through our fitness posters gallery. Look good, feel good, and inspire others to feel the same way. 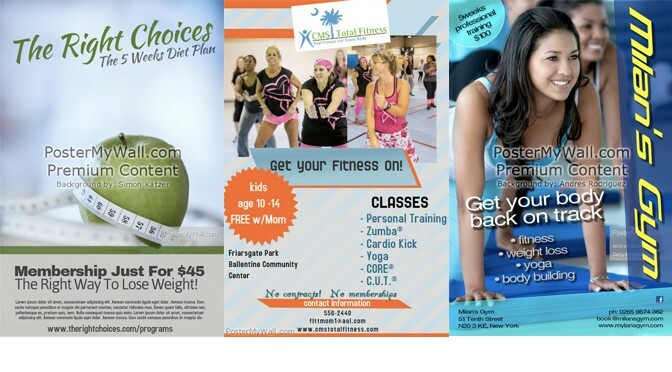 Create your fitness poster today! Jul 7 Make this Eid a booming success for your business!